The Rcom 20 is available in three different models. The standard model (around £260), the PRO model (around £369) and the PRO USB model (around £400) which comes with PC software and a USB connection, the USB version comes with 3 egg trays – one for large Goose sized hatching eggs, one for chicken or duck hatching eggs and one for small eggs such as quail hatching eggs. The model I have reviewed here is the top of the range PRO USB version for up to 20 chicken / duck hatching eggs. It has a top of the range price tag too. The temperature of the incubator was steady in all parts of the incubator. Using a calibrated thermometer from my work, I checked the accuracy of the machine. I found it was accurate. There was almost no fluctuation on the temperature, it was remarkably stable over time. The humidity remained very stable to within ±1 degree over a 28 day period, again, very impressive. Humidity of hatching eggs is often one of the most difficult to maintain at the correct level and it is one of the most debated topics. You are almost certain to be told there was something wrong with the humidity if you don’t get a good hatch (we have an incubation troubleshooting guide that may help you). 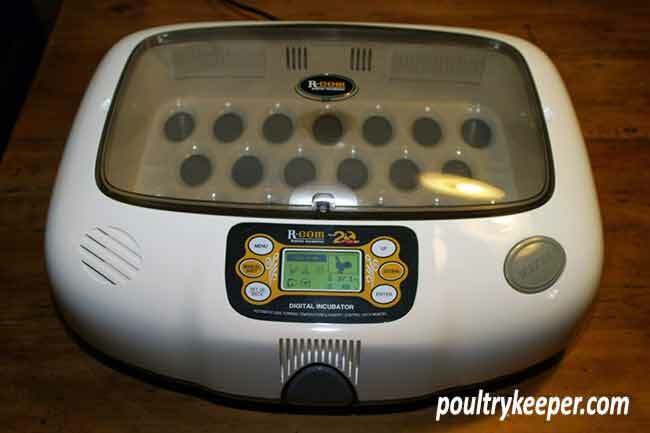 If you are thinking of buying second-hand, it is worth noting that there is an older variant of this incubator and this one has a far better system of humidity generation than the other. The model released before 2008 has a rectangular sponge on end that soaks up a controlled amount of water from a reservoir to evaporate. This works well for a time but we found after 5 or 6 hatches the sponge had deteriorated and crumbled into bits which in turn stops the humidity control from working correctly. After speaking to the distributors, we found out that this was normal and the sponge should be replaced when required. The cost for this sponge was around £7 from a dealer. With me thinking I could buy more hatching eggs with that, I spoke to somebody who had heard ‘on the grape vine’ that a pack of 3 sponges the same can be bought from Wilkinson Stores (in the UK) for a fraction of the cost and should perform the same job. The good news is the 2008 model does away with the sponge and does not suffer from this problem. We swapped our model for this newer version and we have found this model to work consistently well for several hatches so far. The RCOM 20 turns your hatching eggs automatically when operating in one of the pre-set modes. The turning is fully adjustable in manual mode. When turning, it plays a tune but I have to admit I turned this off as it was driving me up the wall at night when I was in bed above the utility room where my incubators live. It is a simple job to deselect the tune via the incubator menu. You need to make adjustments via the menu to set the hatching egg tray insert size. This ensures the egg turning is the correct amount. You don’t want to be turning small hatching eggs through 360 degrees do you! The menu system is fairly intuitive and easy to use once you have the basic idea how incubators works. There are a number of pre-programmed automatic pre-sets that cover most poultry. This allows you to select ‘chicken’ or ‘duck’ hatching eggs for example and start the automatic incubation cycle with ease. There is a very useful ‘D day’ to hatch so you know how much longer your eggs have to go. Temperature and humidity are set automatically and the eggs are turned every 90 minutes. 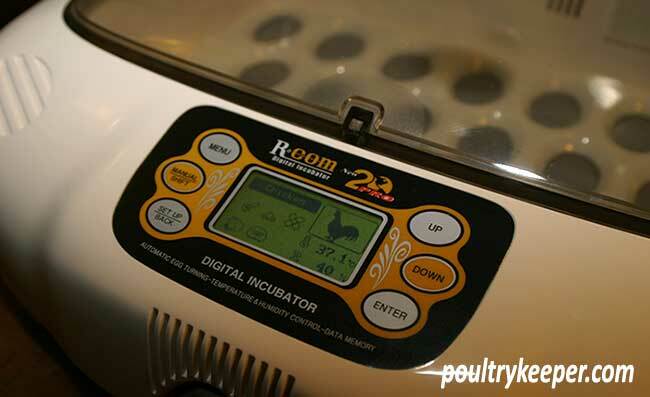 The incubator automatically stops turning the eggs and adjusts to the required higher humidity during the hatching period for the last few days of incubation. Even though the incubator is fully automatic, it is still possible to go into manual mode and make fine adjustments to the temperature or humidity as required. If power fails, the incubation settings are saved. The fan cuts out when the lid is removed. A low water alarm is provided. An alarm sounds if the lid is not replaced. °C can be changed to °F for the temperature display. We ran 2 batches of eggs through under automatic control, Indian Runner Ducks and Marans Chicken hatching eggs and had a hatch rate on average of 90% on fertile eggs between the two hatches. The true test of the fully automatic mode was last summer when I went on holiday for 10 days, leaving our live in guest to top up the water every few days. I returned home and 2 days later all of my chicks hatched. A great welcome home! Incubator software and connection via USB. The RCOM 20 PRO USB connects up to a Windows-based PC via a standard USB cable and has a piece of software supplied with it that can control and monitor the incubator both in real-time and from a stored history log kept inside the incubator memory. After spending a few hours testing the software, I felt the software was a bit disappointing. Whilst the functionality sounded excellent, I found it was very difficult to achieve anything useful with it quickly. It was far from intuitive to use and the speed at which the incubator passed data (9600Bd) to the software was too slow by current standards. Waiting for graphs to display was my biggest annoyance. The system was designed in Korea and much of the English was poorly translated in the manual which added to our frustration in trying to use parts of the software. Despite this, some of the features are very useful, the history graph for example lets you look at temperature and humidity over the incubation period. This enabled me to look at the humidity graph and see how long ago the incubator had run out of water when I forgot to fill it up once and allowed me to see that there had been a power cut one night. The stylish plastic design is easy to clean since the major parts of the incubator come apart after undoing the clips on the rear of the unit allowing most parts to be washed and sterilised easily between hatches. This is certainly welcome on an incubator, some are notoriously difficult to clean with mess and fluff getting into places that cannot be cleaned easily like this. The unit is microprocessor controlled providing lots of adjustment and functionality if required in manual mode. The unit has an automatic pre-set mode that allows easy selection of species. Temperature and more importantly humidity is automatically set and controlled automatically. The humidity control system is better in all 2008 onward models, a sponge is not required. Egg turning control is fully automatic. The observation window is double-glazed and it is easy to view your hatching eggs without removing the lid. The unit is easy dismantled for cleaning. There are some safety alarms and functions (listed earlier). Overall I have found this Incubator to be excellent. If you buy eggs to hatch then you will soon recoup the extra investment required to buy this fully automatic machine. Although I found the software a little frustrating, it does add useful extra functionality to the incubator which is especially useful if you ever plan to incubate precious hatching eggs. If you are buying second-hand, do check if the unit is the 2008 model (which doesn’t have a sponge fitted) as it will save you some cost and hassle. The most popular of the RCOM incubators with fully automatic digital control of temperature, humidity and egg turning, the RCOM 20 makes incubation easy yet still allows fine adjustments to settings or manual operation if required. You can buy the RCOM 20 Incubator by clicking here.